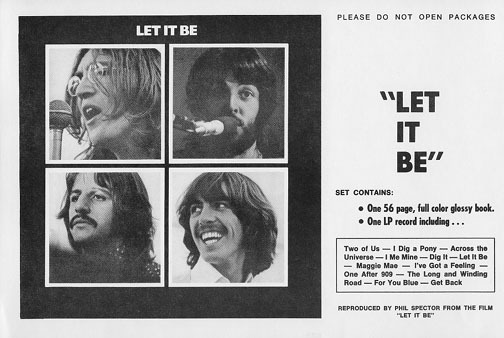 In addition to the standard releases worldwide, the Let It Be album was also issued in a deluxe box set package in at least a dozen different countries. In some countries it came out initially only in the box set, and then the LP was later issued by itself in the standard jacket. Designed in the U.K., the limited edition set included a 160-page deluxe Get Back book with lots of text and hundreds of color photos printed on high quality glossy paper. 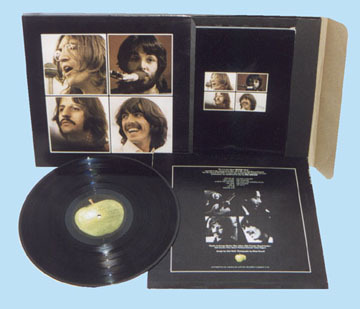 The book was placed in a custom die-cut and recessed cardboard holder which held the LP on top, all of which was encased in an outer slipsleeve. 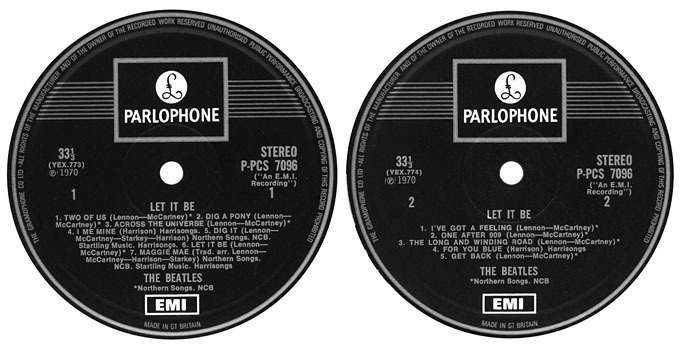 Each country included their own standard issue Let It Be jacket and disc. The books were all printed in England, and most included small stickers on the back (and inside on some) with their own information covering the standard UK printing credits. The only difference in the outer boxes was on the back where the country (and record number on some) were listed along the bottom. The South African version had a sticker on the back cover, upper right corner, that gave the box set number. 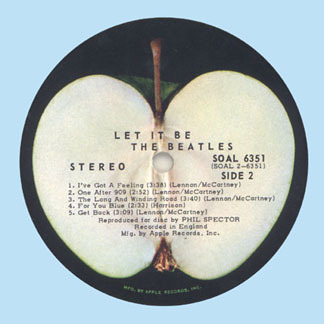 In Japan, Let It Be was first issued only in the box set package, and on red vinyl (among the rarest of all Let It Be box sets), then later repressed on black vinyl, and then issued as a standard black vinyl LP release without the box and book. The books by themselves became quite valuable and sought after during the 1970s and 80s, sometimes selling for as much as $100 for near mint copies. The pages in the books easily became loose due to the way they were bound, which affects their value (and the value of the complete box set). This is of course something to always check before purchasing a box set. In the early 1990s, the Italian bootleg company Vigotone included reprinted copies of the book in their Get Back Journals box set of CDs. Near-perfect copies of the originals, they are almost impossible to tell apart. Compared side-by-side, the photo quality difference is noticeable, but not by much. The main giveaway is that the back covers of the reissue books are blank, listing no credits. However, original German copies of the Get Back books were printed without the back credits so not all "blank back" copies that turn up are fake. Extra copies of the bogus book were available separately in very small quantities, but even those are now hard to find. 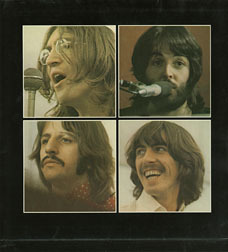 Near Mint copies of the original book have always sold instantly, from the time of their 1970 release through the present. 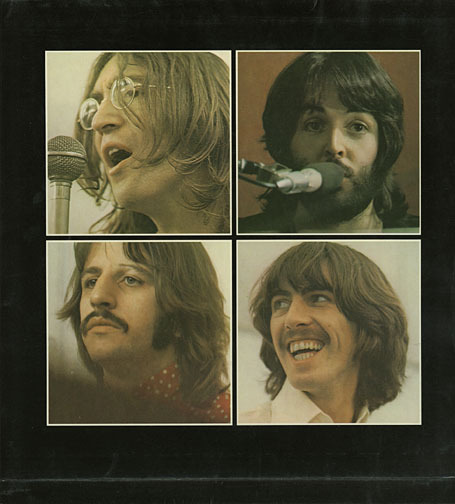 In that grade, it is one of the more sought-after books on the Beatles. Due to their lightweight and thin construction, the cardboard outer slip sleeve and inner book/LP holders are typically difficult to find in near mint or better condition. The clear lamination on the outer box is very prone to peeling or bubbling, especially if there are any dents or impressions. Sealed LP sets do exist for some countries, but are extremely scarce. Finding a near mint copy from anywhere is a challenge in itself, but well worth the search as this is one of the nicest Beatles LP packages out there. The values listed below are for copies in near mint condition, graded strictly. Prices drop sharply for copies in worn or damaged condition. In-store contents advertisement for the box sets from the U.K., incorrectly listing the book as "56 pages" instead of the correct 160 pages. All-caps print at the top stated "Please Do Not Open Packages". Note that these flyers were reproduced in a small quantity in the late 1970s by a Beatles collector/bootlegger. The labels from the Canadian set. This rare orignal sealed Canadian issue featured a "contents" sticker listing the name of the album and song titles. Interestingly, and unexplainable, is the fact that "color" is the U.S. spelling, where the box set was never released, instead of "colour" as is used in Canada and the U.K.. 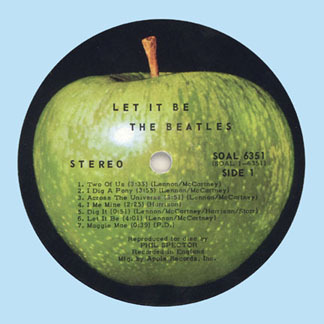 Note also the coloring of the box set cover, similar to the standard worldwide LP release. All other box sets were shaded differently, like the German release shown below. 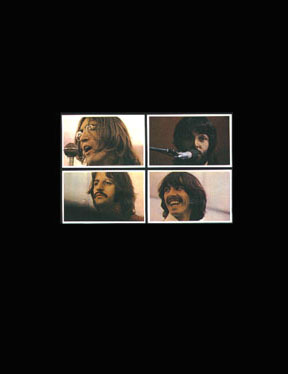 Scarce German Let It Be box set. It was originally believed that they were not released there, but the question of their existence was proven when, in the 1970s, three flat unused outside covers were discovered. As well, complete sets have surfaced in the 1990s. The cover and back credit line is shown above. The "line" near the bottom of the cover is the fold line for the box. Front title card from the Vigotone CD box set. 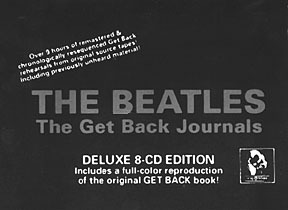 The set included a near-perfect reproduction of the 160-page Get Back book. Canadian box set photos courtesy of Andrew Croft and Robert Beaudoin.  Thanks also to Thomas Deak, Ted Greenwald, Neil Painter and Tom Warren for additional information.